On the eve of International Youth Day, WYSE Travel Confederation joined with the United Nations World Tourism Organisation (UNWTO) and Hilton to discuss the impact of the growing youth travel market and the influence young travellers have on developing sustainable tourism. 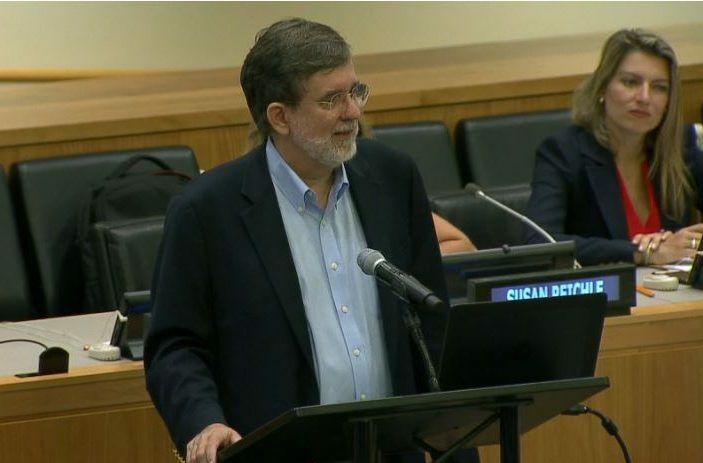 WYSE Travel Confederation board member and Hostelling International USA CEO, Russ Hedge, represented WYSE Travel Confederation in the UN Youth General Assembly discussion, The Power of Youth: Making a Difference in Sustainable Tourism. The session was held in New York on 11 August 2017. WYSE Travel Confederation is an affiliate member of UNWTO and is working closely with the organisation to support the UN’s International Year of Sustainable Tourism for Development 2017 initiatives. Hedge presented findings from The Global Report on the Power of Youth Travel by the UNWTO and WYSE Travel Confederation, which shows that youth and student travel markets are increasingly important and resilient. Young people represent around 23% of the 1,235 million tourists travelling internationally each year. Hedge described the vast opportunities available in this growing market. “For emerging entrepreneurs that is an amazing market place. For creatives, it is an audience all about new ideas new expectations infused by travel. And, for change makers this is a group all about evolving attitudes and behaviours you can build upon,” Hedge explained. Hedge highlighted research from the New Horizons survey, WYSE Travel Confederation’s global survey of the youth and student traveller which is conducted every five years. The survey has consistently found that youth and student travel is much more than holiday travel. Youth travellers also pursue language learning, work and study, volunteering, and au pair opportunities.